Always an important transport nexus, Caen today has convenient trains, buses, trams, rental cars & bicycles, and maps for how to get around the city. 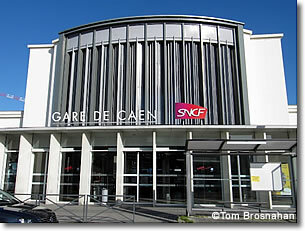 The Gare de Caen SNCF is the transport hub of Caen, the destination for trains from Paris's Gare St-Lazare. 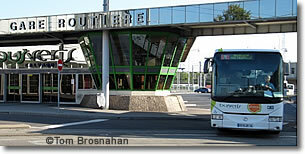 Right next to the gare is the Gare Routière (bus terminal), for regional and intercity buses, including to Honfleur. In front of both stations are stops for twisto city buses and for two tram lines: consult the system route maps, buy a ticket from one of the ticket machines at the stop using either euro coins or a credit or debit card with a chip, then take either Tram A or Tram B to the Saint-Pierre stop near the Château and the Office de Tourisme de Caen. A V'elo bicycle rental stand is also near the station, if you'd prefer to cycle; and taxis if that's your preference. Throughout the city are numerous Indigo car parking lots. The entrance to the convenient one beneath the southeast side of the Château is difficult to find at first: you enter by the Saint-Pierre Church), but don't be surprised if you miss it on the first pass and have to backtrack to enter. Gare de Caen (Train Station).